I’ve said it many times before -- they don’t write newspapers like they used to. I’ve read a lot of newspapers from the 19th century, but it also includes some 20th century writing also. Recently, I ran across a wedding announcement from when my grandparents got married. It’s a rather long article with a lot of great detail. 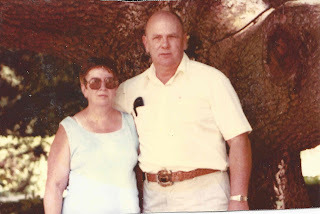 I thought I would make it this week’s Reminiscing article, both as a way to honor my grandparents, and as a way to honor the writers from those long ago newspaper days. This is a perfect example of why local papers are so much better than corporate conglomerates. Local papers knew their communities. Baskets of white carnations and gladioli, flanked by large palms, and by two lighted candelabra, adorned the chancel of the Methodist Church for the wedding of Beverly Hall and Charles Bacon, Jr., Saturday, at 2:30 p.m. The double-ring ceremony, read by the pastor of the Methodist Church, Rev. Raymond H. Draffin, united in marriage the daughter of Mr. and Mrs. Carroll Hall of this village and the son of Charles Bacon of Ridgeway. Preceding the marriage service, Mrs. Clarence Gracey gave a program of organ wedding music, followed by three vocal solos, “I Love You Truly,” “O Promise Me,” and “Always” sung by Mrs. S.G. McCoy. The bride, who was given in marriage by her father, wore a wedding gown of white satin, fashioned with a fitted bodice, a sweetheart neckline and long sleeves. The skirt formed a full court train. The bridal veil of illusion fell from a tiara of pearls, and was finger-tip length. This gown had a special sentimental value to the bride as it had been worn by her sister, Mrs. Henry Ralph, on the occasion of her marriage in September 1946. The bridal bouquet, colonial in style, was of bride’s roses. Mrs. Ralph, as her sister’s matron of honor and Mrs. Harley Peters, as bridesmaid, wore identical floor length taffeta gowns -- Mrs. Ralph’s, pink, and Mrs. Peters’ blue -- made with a fitted bodice and full skirt. Each wore a head dress and long mitts to match her gown, and each carried a cascade bouquet of carnations. Mrs. Ralph’s flowers were green, and Mrs. Peters’, yellow. The bride’s mother wore a navy blue crepe dress for her daughter’s wedding. Her accessories were also navy, and white camellias formed her corsage. Mrs.Herbert Lacey, the bride’s maternal grandmother, also wore a navy blue costume, and a corsage of pink carnations. George Pogel of Lockport, stepbrother of the bridegroom, attended him as best man. The ushers were Henry Ralph, the bride’s brother-in-law, and Francis M. Conley, Jr. Following the ceremony, a reception was held in the church parlor was attended by 100 guests, who came from Rochester, Medina, Newfane, Niagara Falls, Lockport and Sherman. Assisting with the refreshments at the reception were the bride’s aunts, Mrs. Floyd Lacey and Mrs James Lacey of Lyndonville and Mrs. Laura Land of Sherman. After a short wedding trip, Mr. and Mrs. Bacon will take an apartment in Ridgeway. For traveling the bride chose a gray gabardine suit, with which she wore navy and flamingo accessories, and a corsage of white camellias. 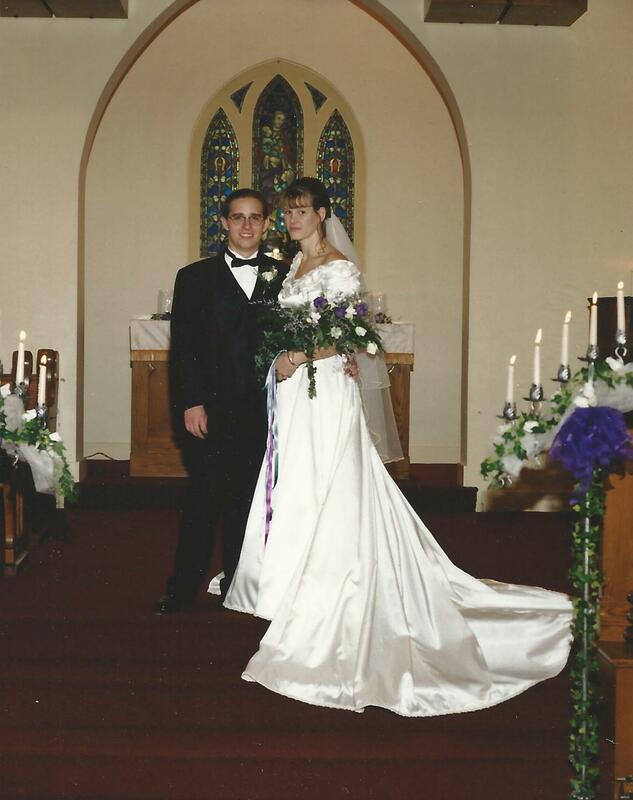 The bride was graduated from Rochester Business Institute, which she attended after graduation from Lyndonville Central School. She is at present employed as a clerk in the Citizens State Bank. The groom is associated with the Harrison Radiator Company, Lockport. Craig Bacon wishes he had a photo of this wedding. As an interesting side note, Craig’s parents were married in this church, and so was Craig.